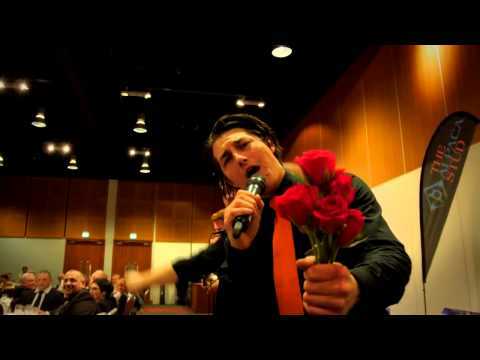 The Singing Waiters: Live! offer the perfect surprise entertainment for your special event with music played live on guitar. 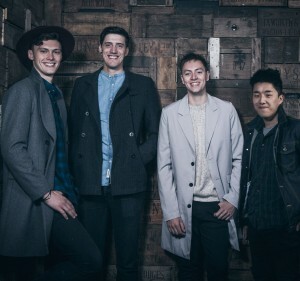 Using classically trained singers and West End performers they perform an impressive range of music with a set-list designed to excite any audience. Number of Reviews and Counting... 32! Singing Waiters: Live! avoid formal opera and dated backing tracks; preferring to offer unique performances of popular music played live on acoustic guitars. This light-hearted and entertaining take on the Singing Waiters combines music and laughter to great effect. The Singing Waiters greet your guests on arrival posing as real staff; dressed in the same uniform and working alongside the real waiters or catering team. Your guests will not suspect a thing, as they serve with witty charm and professionalism, getting to know guests and building rapport. Imagine the surprise when announcements are made and the 'waiters' dramatically break into song, playing guitars and entertaining the room. With amazing vocals, beautiful harmonies and guitar work; a larger than life performance is promised that will have your guests in stitches and singing along. Your guests will never see it coming and the waiters promise to deliver a surprise to inject energy into your event - just when it's needed. 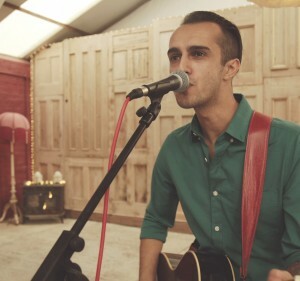 The Singing Waiters are unique in the industry because they do not use dated backing tracks; all of our music is played live on acoustic guitars. Their song selection is incredibly varied and covers a broad range of musical styles and genres from classic "Rat Pack" music through to the modern day - with everything in between. Every song will be loved by your guests and they won't be able to stop themselves from joining in. The act is designed to work with three Singing Waiters. However, The Singing Waiters do have a number of professional singers and musicians and for a larger audience can offer four or more performers as required. The Singing Waiters were absolutely brilliant from beginning to end. Rob and the guys made the day for us, and our guests. Weeks on and all our guest still talk about it how great they were. They were amazing. Blending in to serve drinks and help with the other waiters throughout the day. Then as pudding was served they took everyone by surprise as they entered and started their act. They had everyone up singing and dancing from start to finish. 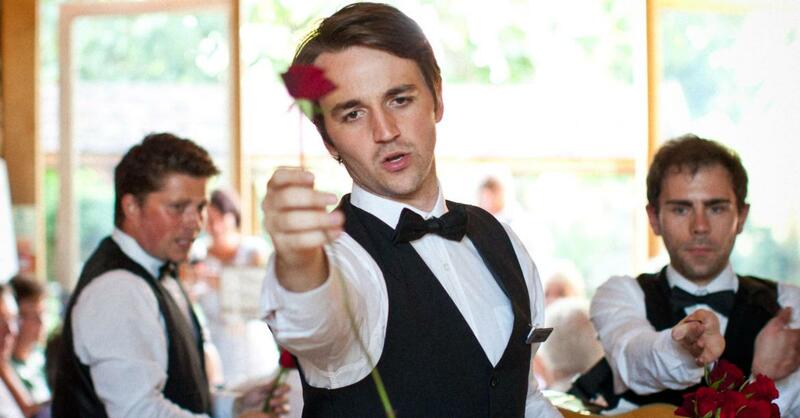 We can't recommend The Singing Waiters enough. 3 weeks on and everyone is still talking about how good they were. Brilliant and so professional. All the guests really enjoyed it and were totally surprised. Many Thanks. These guys were brilliant, they sang the songs that we requested and even managed to sing the unique version of 'Mambo Number 5' which included all the cats names which the bride had named her tables after. They definitely lifted the mood and became a talking point for the rest of the wedding and even now! Would not hesitate in recommending them to anyone, very professional and extremely talented!! Absolutely fantastic, brought tears of laughter to the whole event so a very big thank you. As always the singing waiters were amazing. Thanks! They were brilliant! All of our guests found them absolutely hilarious! 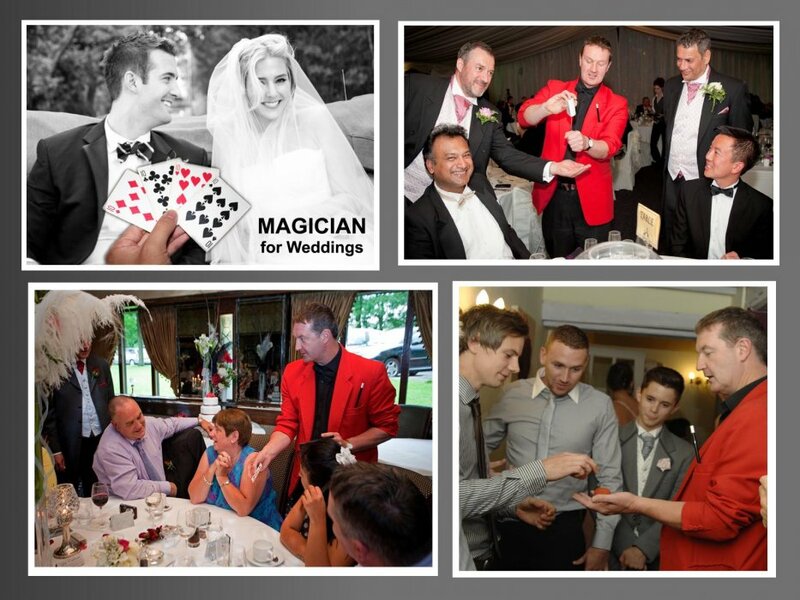 And it was a great surprise for the groom, it's just the sort of entertainment he loves so it was perfect for our day. They were really professional too and were very flexible and accommodating with our requests. Would recommend them time and time again! They were absolutely superb - everyone loved them! The Singing Waiters were absolutely incredible!! So professional and every single person at the party was raving about them. They completely made my party!! Anyone having a party should really think about using them! The biggest thanks to The Singing Waiters! Rob, Rob and Craig were truly brilliant - such a fabulous thing to do! Fantastic entertainment! What an act. Would recommended for any corporate event! They were definitely the highlight of the evening. Even the opera buffs loved them. The Singing Waiters were excellent! All of our guests enjoyed them and they were very surprised when they suddenly started to sing! We cannot fault them and certainly would recommend them. Thank-You,Thank-You, Thank-You! Absolutely fabulous! Made the day. Everyone was buzzing after their performance and I wouldn't hesitate to recommend them... every one thought they were amazing. Thanks for a great evening - it was all anyone could talk about! The waiters were professional throughout the entire evening and gave a fantastic performance. Two weeks on from our wedding and these amazing guys are still all anyone who came to it are talking about!! There are not enough superlatives in the dictionary to emphasise how brilliant they were. Everyone was fooled by Boris, Viktor and Stanislav our 'Russian waiters' including a table full of police colleagues who are no strangers to sniffing out a fib or two!! I cannot thank the Singing Waiters enough for making an already amazing day just so much more special for us and for our guests who absolutely loved them. Thank you from the bottom of our hearts. Jo, Rob and Joe were fantastic! The whole process was easy and stress-free and the overall effect was slick and professional and went down a storm. Success was an understatement. The waiters completely exceeded our expectations, they were hilarious and got the party atmosphere in full swing at our wedding. The organisation and contact beforehand was extremely professional and Warble were very helpful too. Well worth the money! A fantastic addition to any party! 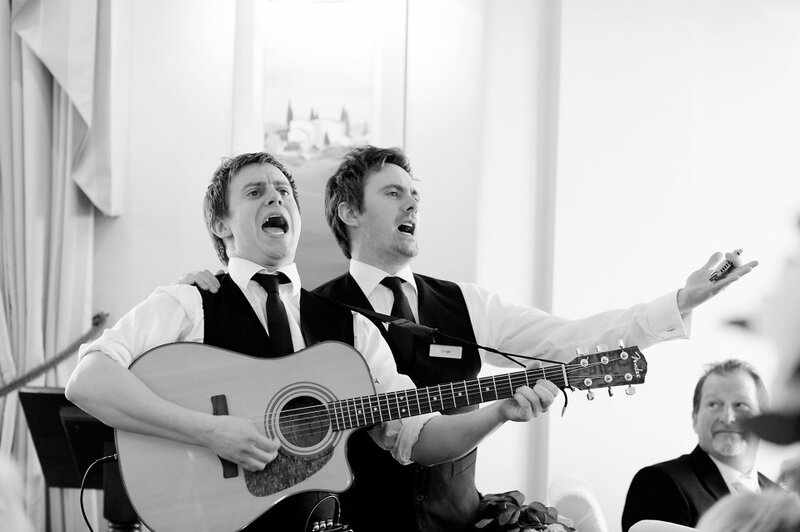 The Singing Waiters were the highlight of our wedding day! they had all of our guests talking even before they started singing - due to their charm and great acting skills! When they started singing it really got our whole party going. Everybody absolutely loved them and are still talking about it now. I would not change a thing and I would book them again without hesitation. Thank you for bringing so much fun and enjoyment to our wedding day! The Singing Waiters was absolutely BRILLIANT! I would highly recommend them for any corporate event - very professional and lived up to my expectations. The disguise as Russian Waiters was very convincing as well! 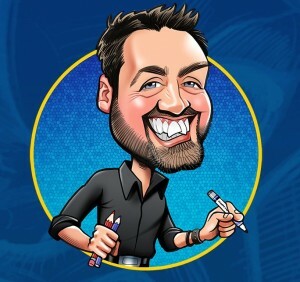 The booking process via Warble Entertainment was easy and quick, also very helpful that I could speak directly to the artists to plan and organise our event on the day. If you are looking for entertainment, I would highly recommend both Warble Entertainment and Singing Waiters. Our Singing Waiters: Live really couldn't have been better - perfectly witty, professional, charming and entertaining as waiters, musically talented and downright hilarious as singer-musicians. Our audience laughed 'til they cried, sung along (to my surprise) and called desperately for encores when the act had finished. I wouldn't hesitate to recommend The Singing Waiters: Live to anyone looking for a fresh, entertaining and - importantly - LIVE - act: they make the backing-tracked alternatives look dated. Thank you so much to Jennie at Warble for talking our options over with us, understanding that we were looking for something a bit different and recommending this superb act. Perfect. Fantastic, absolutely worth every penny. Went down a treat with all the guests. Great guys who got chatty with all the guests and then surprised them all. Would recommend them every time for weddings, functions etc. they would get any crowd talking! Thank you Warble and the Singing waiters for making my Special day so memorable! Joe and Joe were amazing and so easy to work with. Everyone said what a fantastic time they had because of them and have been talking about them for days. It was a great act to have during the canapés and drinks reception whilst we were having our couple shots and they really got everyone laughing. I would certainly recommend them, they were faultless! Hi Samantha, just wanted to say 'you told me not to worry' and I needn't have!! The Singing Waiters were absolutely fantastic on Saturday night. Everyone loved them and they were such good fun. It all made for a really good night. They arrived early, were very professional, friendly and totally helpful. They actually do serve the drinks as well as they sing! Everyone loved them and they gave so much fun to the party. I would highly recommend them. Thank you guys - you were great. I would just like to say how fantastic Rob and Neil were. I have had nothing but praise for their professional performance and would certainly not hesitate to book them again and also to recommend them to others. Please thank them for their help as they were so much fun. Absolutely brilliant from start to finish thank you so much. Very, very funny and a great act. Without exception everyone was totally taken in, absolutely loved it and couldn’t stop talking about it and probably won't for a long time to come. Great performance would definitely recommend. Many thanks for all your help. 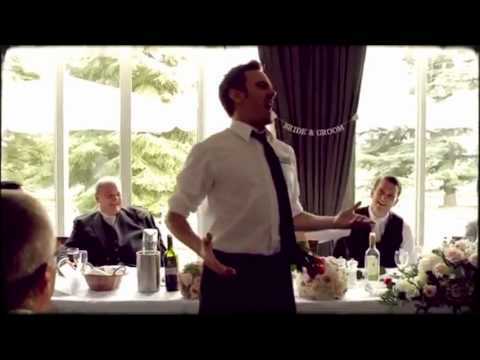 The Singing Waiters have performed at hundreds of private and corporate events across the UK and abroad and have even performed in the House of Commons! The Singing Waiters: Live have also entertained celebrities and the Royal family. Do I need to inform my venue/caterer about your performance? You should contact your venue and/or caterer and let them know that we are performing and if they have any concerns we are more than happy to contact them immediately to discuss our act. It is important to ensure that your venue/caterer are happy for us to attend as we will be posing as members of their waiting staff for a large part of the event. Your venue/caterer can be assured that we are very professional and experienced waiters – we do not get involved with food service so have no need to enter their kitchens or service areas. As a general rule we assist with reception drinks and act as wine waiters only during the meal. Also to avoid confusion please point out that we are not intending to replace any of their existing staff. We do have full public liability insurance and these certificates can be provided to your venue upon request. Will you be in contact with my venue/caterer directly? We will be in touch with your venue or caterer directly approximately a week before your event. We will run through our performance in detail and answer any questions they might have. When do I need to confirm the exact timings and when do you arrive on site? Do not worry too much if you have not given us the exact timings of your event or if they change as we approach our performance. We will be arriving on site approximately 90 minutes in advance of our start time and will remain at the venue throughout your event until after our music performance. If your timings change then please do let us know; however everything can be confirmed when we contact you before your event. At what point in the event would you recommend the surprise singing performance to unfold? Our act works best when we can be in our role as waiters from when guests arrive ensuring that we have the maximum amount of time to build rapport with those attending. But when is the best time for the singing part of our act to happen? We recommend this to take place towards the end of any dinner – preferably over dessert – which is a real tried and tested point for the singing to unfold. Firstly by performing during dessert we have everyone exactly where we want them as guests will obviously not know that we are going to be surprising them. If we perform between courses or at the very end of the meal then guests will naturally be out of the room or moving around – so this point in your event works very well for us. This is also the point in an event where there is a natural loss of momentum and so our performance is perfectly suited at this stage to energise guests and drive things forward. If you are planning on doing speeches at the end of your meal – then you will find that our act works brilliantly just before them and will actually help them immensely! If you are not having a formal sit down dinner – then we usually recommend allowing us at least 2 hours as waiters before beginning to sing. Our act is of course very flexible and can work in a wide variety of ways – so do feel free to talk us through how you think it would best suit your event and we will absolutely be able to accommodate. When will you be contacting me? We will be contacting you a few weeks before the event to run through any final details. We will send you an email to find a convenient time to call you and ensure that you are in a position to talk safely. If you have any questions at all then please do feel free to contact us at any point in the lead up to our performance. Who should I tell about the performance? This is a surprise performance and we recommend that you tell as few people as possible – preferably no-one! If this is a surprise for specific guests; do ensure that the venue/caterer are also aware not to mention our performance. When can I decide on which songs you will be singing? We have quite a broad set-list of popular music with around 25 songs arranged for three parts and all singers. Please let us know if you would like to see our set list; however the list does change and it is likely there will be new tracks as we approach your event. For this reason we usually leave song decisions until closer to the event date. We also like to recommend a set-list for your event – we have been doing this for many years and feel that we can choose the perfect songs for any occasion. It is important that you have the right music for your event but do carefully consider our recommendations and trust us when it comes to song choices. We are also happy to put together an arrangement of a single track for you should you require something specific but will require at least four weeks notice to do this. How do I know which performers are attending? We have a large pool of performers who have been singing with us for many years. The act is completely standardised and so no matter which performers attend you will have exactly the same experience. All of our performers are working West End professionals and as such we are unable to confirm availability until close to the event date. If you have seen our act before and wish to request specific singers then please do let us know – if they are available we will be sure to book them. We require a changing space and hot food/soft drinks for all performers. It is important that the performers can have a room to store our instruments, use as a crew room throughout and also warm up/tune up later in the event. We need to maintain the secrecy of the act but also our performers need somewhere to base themselves during their time at the venue. A spare conference room or office is ideal and if possible it should be located away from the event. With regard to food: we would prefer to eat upon our arrival; however we do appreciate that your venue/caterer may be very busy and so we are happy to have this whenever is convenient. Please get in touch if you have any questions about our requirements. Typically the Singing Waiters will be with you for up to four hours with the music performance lasting for around 25 to 30 minutes. If the Singing Waiters are performing as a mix and mingle act around tables then they can play for up to an hour. 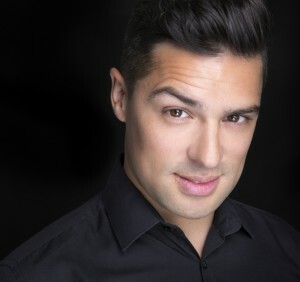 Customers who have enquired for The Singing Waiters: Live have also been interested in the following Singing Waiters and Surprise Singing Acts for hire in London and the South East. For more information or further options, please call 0845 643 9384.